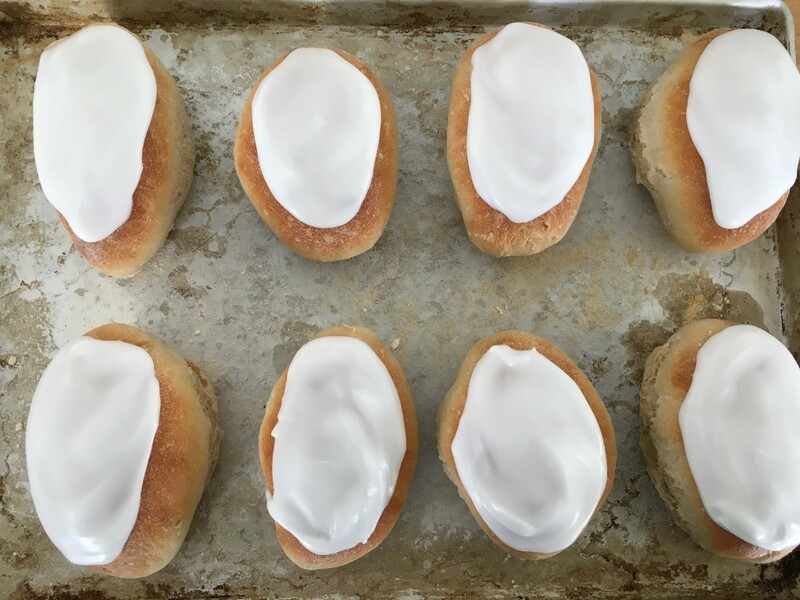 When I went to collect my son from a friends’ house the other day I took some iced buns I’d just made as a thank you. On handing them to the father he took a whiff and started rhapsodising about iced buns he’d had as treat when young and we merrily reminisced about trips to the bakers as children. It seems the iced bun has been around for a long time (remember those in the Railway Children on Bobby’s birthday? ), stood the test of time and is pretty much loved by everyone. Essentially just a bread roll, sometimes sweetened, sometimes with raisins but always finished off with a slick of white icing. I’m all for children having treats but as some of the offerings in the shops seem so full of sugar, preservatives or other suspect ingredients, I would rather make my own and know what is going into the treats (and my children). These buns are so plain I can live with the small amount of icing on each one. I make these on a regular basis and realising how popular they are thought I should share the recipe with you quick sharp. Fantastically easy, the only requirement when making them is to allow a bit of time for the dough to rise. This recipe uses my regular plain white bread recipe (March 2016) but you could ramp these up by using the slightly richer dough of my Milk Loaf (July 2014). As often as not I will use half the dough to make a small loaf and the rest to make iced buns (or indeed any small rolls/flatbreads/pizzas etc you may need). 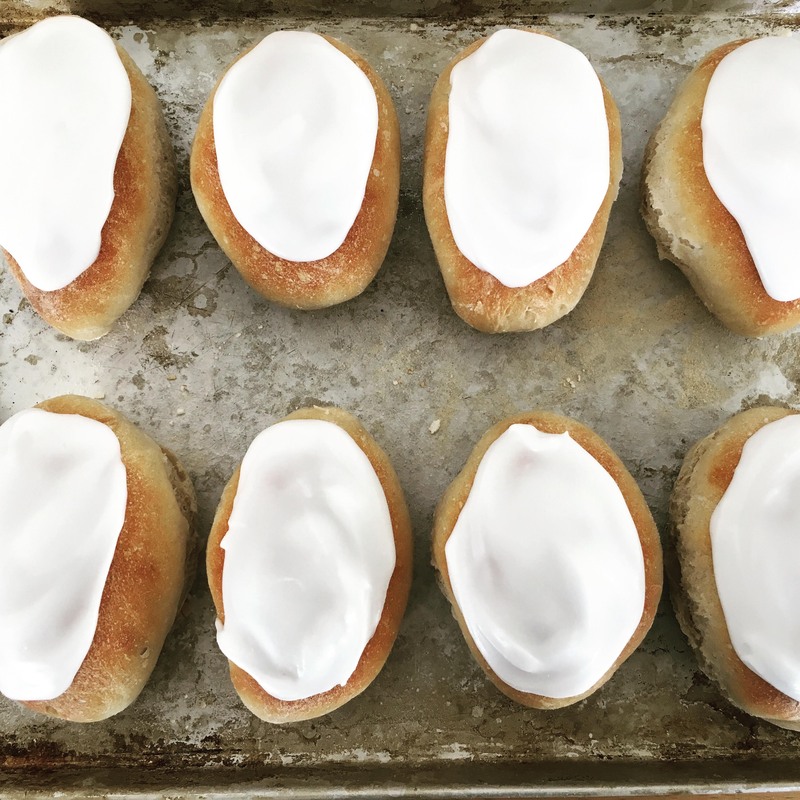 Half the dough will yield around 12 small finger buns but of course you can make fewer, bigger ones – simply extend the cooking time a little. Incidentally, the friends father asked for Cinnamon buns next time….. It you have a stand mixer then this dough will take literally minutes of your time to rustle up. Before I got ours though I still made and happily kneaded it for around 10 minutes. It is a calming way to spend 10 minutes (come on, it is only 10 minutes!) and you will be rewarded tenfold! I haven’t specified the amount of icing sugar because it really depends on how many buns you make. Put some in a bowl, cautiously add a few drops of water, you don’t need much and then mix hard. Put the flour into a large bowl (or the bowl for your mixer) with the salt on one side and the yeast on the other. Add the water and bring it all together from a sticky mess into a dough. Then using the dough hook put your mixer on for 6-7 minutes or knead by hand for 10. Sprinkle the inside of the bowl with a little extra flour, put the dough into the bowl, cover with a cloth and leave somewhere warm and draught free for an hour. After this time you will see your dough has risen so punch the air out of it by kneading a couple of times then either split it in two if you want to make a loaf and buns or just make a load of buns. Take small balls of dough and roll them to form a sausage shape. Place on a flour dusted baking sheet. 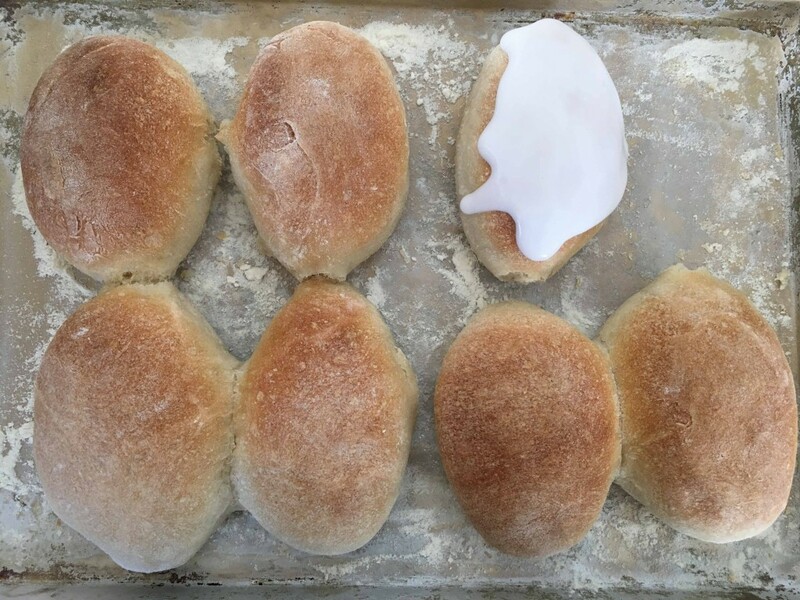 Form the remaining ball into a loaf shape and place on another flour dusted baking sheet. Cover again and leave for a further hour. Towards the end of this time preheat your oven to 200. Bake the rolls for 10-15 minutes depending on size until they are bronzed on the top and bottom, the loaf will take around 20-25 and sound hollow when you cautiously tap the bottom. Let them cool on a wire rack, the rolls need to be completely cool so the icing doesn’t run straight off them. Mix up icing sugar with a few drops of hot water until you get the desired consistency and ice the top of the buns. Serve to very happy faces.